Do you need stair nosings when you have an elevator? 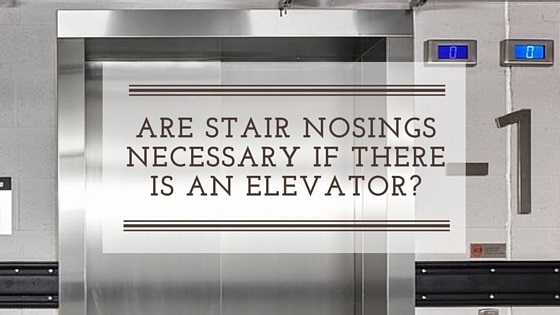 One question you may have is whether stair nosings are still necessary when an elevator "lift" is in use in your building. By design, the stair nosing inserts provide visual contrast that help prevent slips and trips. Whether for an emergency exit stairwell or one inside the facility that is not deemed an emergency exit, providing anti-slip capability for people going and up and down the stairs is critical. Not only that, but the nosings provide durability and protect the edge of the step. Since elevators are not recommended in the event of a fire evacuation or other emergency, adequate access to stairs and anti-slip components offered by the stair nosing inserts help prevent slips during an emergency situation. Stair nosings can be installed for a variety of stair surfaces, from carpet to hardwood to concrete and more. For more information about Gradus nosings, feel free to contact us or download the latest catalog.